Companies throughout Asia are increasingly paying more attention to their inclusion and diversity initiatives and within that, their gender workplace programs. Awareness and implementation of such programs differs greatly on a country by country (and company by company) basis. One trend however, is that many companies in Asia appear to emphasize harmony and inclusion when promoting workplace diversity. In other parts of the world, differences and individual uniqueness among employees are celebrated instead. With the #MeToo movement capturing global attention, businesses in Asia are now expected to focus on gender inequality in the workplace. Several gender inequality trends in Asia mirror those of women entering developed labor markets. Women tend to be active in less secure and lower paid industries. They are also underrepresented in senior positions regardless of sector. To exacerbate the situation, the leaking pipeline of female talent is growing as the proportion of female graduates do not result in similar proportions of women and men in management positions. Companies in Asia are increasingly focusing on mentoring, family-friendly policies and flexible working arrangements to help bridge this gap. Solving these issues is not only the right thing to do, it is financially beneficial for the region’s economy. It has been reported that the East Asia and Pacific region could add $4.5 trillion to their collective annual GDP by 2025, a 12% increase over the business-as-usual trajectory, by advancing women’s equality. Culture is one key factor in influencing gender equality. 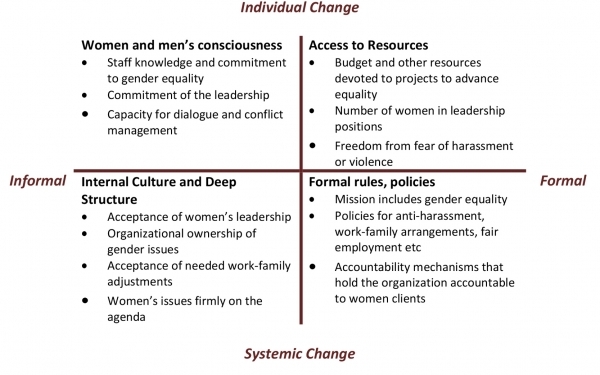 The Rao Kelleher Gender at Work is a framework that highlights certain barriers that culture engenders. Such norms can sometimes explain the large variations in gender outcomes and prevalent aspects of gender inequality commonly found in Asian economies, regardless of national policies and a country’s stage of economic development. This insight emphasizes the need for companies to adapt gender workplace initiatives to a specific county context and cultural norms (and bias) to ensure relevant and effective gender programs in Asia. CSR Asia is hosting its annual Summit in Hong Kong, which offers two deep dive sessions focused on gender equal workplaces. At the “Women in the Workplace” session on September 18th, companies will highlight what successful Asian workplace initiatives have in common and the challenges to consider. Companies engaged in Vietnam, Indonesia, Myanmar and the Philippines are recommended to attend the “Driving Gender Equality and Measuring Progress for Success” session on September 19th. Investing in Women will cover country specific data insights on gender workplace practices in the latter four markets and how EDGE Certification, a leading assessment standard, can support gender equal workplaces. We look forward to having you participate in these important dialogues and welcoming you at CSR Asia Summit 2018.